Bolivar Trask from X-Factor #206 (August 2010). Art by Valetine De Landro. The character was portrayed by Bill Duke in X-Men: The Last Stand and by Peter Dinklage in X-Men: Days of Future Past. Bolivar Trask was created by writer Stan Lee and artist/co-writer Jack Kirby, and first appeared in Uncanny X-Men #14 (November 1965). Professor Charles Xavier invites Trask for a public debate on human/mutant relations. Xavier argues that mutants are just like humans and not evil, but that does not convince Trask revealing the Sentinels. But Trask and his scientists had apparently created a too adaptive, open-ended tactical/strategic programming, and as a result the Sentinels turn against him, claiming that they were superior to humans. The Sentinels left with Trask and brought him to his first creation, the Master Mold, who orders him to construct more Sentinels. To stop the Sentinels, Xavier summons the X-Men. The X-Men fight the Sentinels, but Beast is captured. To reveal the X-Men's secrets, the Sentinels tell Trask to use a device to read Beast's mind. Trask discovers that the X-Men were mutants protecting humanity and realizes that he had been wrong. He helps the X-Men defeat the Sentinels by sacrificing himself to destroy the Sentinel's base. Recently in X-Force, Bastion having been reactivated by the Purifiers has apparently resurrected Bolivar Trask through use of a Technarch to be part of a team of the world's foremost mutant killers. He was apparently given credit for the deaths of all mutants, being the inventor of the Sentinels, had the highest record of mutant kills: 16,521,618. Consistent with the remorse he had displayed at the time of his death, Trask killed himself after escaping Bastion's mental control. Master Mold would return and Bolivar's son Larry Trask, still unaware of his own mutant status (who had prophetic dreams), would follow in his father's footsteps and create new Sentinels to avenge his father. Later, Bolivar's nephew Donald Trask III would be recruited by the villain Cassandra Nova to gain control of a group of Sentinels in Ecuador. The machines, now varying in size, will not harm Trask DNA. They obey Donald's orders. However, once Nova is done copying all of Donald's DNA, Nova kills Donald and takes over the robots. Bolivar Trask has a brother named Simon Trask, the founder of Humanity's Last Stand. In the 1995 storyline "Age of Apocalypse", Bolivar Trask married Moira Kinross and together they designed heavily armed Sentinels to fight Apocalypse. These Sentinels were better programmed and even capable of reasoning with mutants if they protected humans (their primary objective). Bolivar participates in a plan to bomb North American Apocalypse forces, though this would mean extensive civilian deaths. [volume & issue needed] He returns in the 2012 launched Age of Apocalypse ongoing series, as one of the leaders of the remaining human resistance. His daughter Francesca is a main operative in the X-Terminators (code-named "Fiend") alongside Prophet, Good Night, Horror Show, and Zora Risman aka DeadEye though she and Bolivar have a rocky relationship. In the 2008 miniseries Civil War: House of M, Bolivar Trask is sworn in as the Vice-President of the U.S.A. and creates Sentinels to fight against Magneto in his rise to power. Magneto confronts him on board the Helicarrrier. Trask summons Sentinels in self-defense, but they go into non-lethal mode as the ship is staffed with humans. Trask over-rides this, causing the death of many SHIELD agents. Magneto then throws Trask into a Sentinel beam, causing his disintegration. The Ultimate Marvel incarnation of Bolivar Trask is featured in Ultimate X-Men as the architect for the US Government 'Sentinel Initiative', a response to Magneto's terrorist attacks on Capitol Hill. Initially, the Sentinels patrolled Los Angeles and then New York City, destroying any human containing mutant genes. However, these attacks ceased after the X-Men rescued the President's daughter from the Brotherhood of Mutants. He discovered the Savage Land's location, and dispatched to destroy Magneto's paradise by order from the President of the United States. This proved to be a foolish move when Magneto easily reprogrammed the chromium-built machines to destroy humankind. After a subsequent Sentinel attack on Washington, D.C., the Sentinel Initiative was shut down. [volume & issue needed] He has recently appeared in the Sentinels story arc of Ultimate X-Men, revealed as being employed by the Fenris twins to build the new Sentinels currently attacking mutants. This would suggest that the government no longer employs him, perhaps due to the failure of the Sentinel Initiative. Feeling horrified by all that he has done, he allows himself, during Angel's attempted saving, to drop into the heart of an explosion and is killed. Another iteration of the character is also featured in Ultimate Spider-Man as the employer that stole the cancer cure project created by Edward Brock Sr. and Richard Parker. Because of being more interested in military applications, he deliberately crashed a plane carrying Edward, Richard and Mary Parker just to gain full control of his employees' project (which is legally his property). Trask later hires Silver Sable and the Wild Pack to capture Venom (Eddie Brock Jr.) to experiment onto with Dr. Adrian Toomes's help, however, the Beetle abruptly breaks into Trask's facility which allows Venom to escape. The story continues in the Ultimate Spider-Man video game. He and Toomes attempt to re-create the Venom suit. To do that, Trask hires Silver Sable and the Wild Pack to once again capture Eddie Jr. and later Peter Parker. After Peter is freed from the Carnage symbiote, Venom goes after Trask. Upon Spider-Man confronting Bolivar about info on Richard (and obtaining the files), Venom attacks with Bolivar making way to a helicopter...which he doesn't know how to operate. Spider-Man had to fight Venom to save Trask. Trask is later arrested by the arriving S.H.I.E.L.D. agents and later confronted in an offshore prison by Brock. Venom finally kills Trask off-screen for what he made Venom do. Bolivar Trask appeared in the 1990s animated series, voiced by Brett Halsey. This version is the Sentinels' creator and co-conspired with Henry Peter Gyrich and Cameron Hodge against mutants. But when Master Mold endangers Robert Kelly's life, he ultimately sacrifices himself to destroy his creation but survived unlike his comic book counterpart. Colonel Bolivar Trask appeared in X-Men Evolution, voiced by John Novak. This version is a former member of S.H.I.E.L.D., and a noted anthropologist and cyberneticist studying the process of genetic mutation. Trask concluded the mutants would one day replace humans as the dominant species on Earth if left unchecked. He decided to prevent this by designing an army of robotic guardians who would apprehend mutant kind. In "Day of Reckoning" Pt. 1, he kidnapped Wolverine as a test subject for his Sentinel prototype. The Sentinel was able to defeat Wolverine. After his Sentinel prototype was destroyed and the X-Men were cleared, Trask was arrested and placed in prison. In "Uprising", S.H.I.E.L.D. superiors release Trask from prison so that he can continue his Sentinel project under Nick Fury's supervision so that the world would be ready for Apocalypse's threat. Bolivar Trask appears in Wolverine and the X-Men, voiced by Phil LaMarr. In "Thieves Gambit", he is shown as a scientist working for Senator Kelly alongside Dr. Sybil Zane on the Sentinel Program's creation. Though the building it was being developed in was destroyed in a fight with Wolverine and Gambit, Bolivar and Dr. Zane escaped. In "Badlands", Trask ran a laboratory that Wolverine, Shadowcat and Forge infiltrated. When Wolverine ended up captured, Bolivar figured out about the mutant's adamantium skeleton, resulting in advanced-type Sentinels that the future X-Men encountered 20 years later. In "Backlash", Trask had managed to create Master Mold to create the Sentinels. He was with Senator Kelly, Warren Worthington II and Dr. Zane when they watch the Sentinels fight the X-Men and the Brotherhood of Mutants. In "Foresight", Trask ends up launching the Sentinels to Genosha under orders from Mystique (disguised as Senator Kelly) and later gets knocked out by Mystique. Trask Industries is mentioned in the 2017 live-action series The Gifted as well as operating the Hound Program under Roderick Campbell and develop Sentinel Services. Peter Dinklage as Bolivar Trask in X-Men: Days of Future Past (2014). Bolivar Trask was included in the first draft for the 2000 film X-Men, written by Andrew Kevin Walker, but had to be removed for the film to be greenlit by the studio. The character appears in the 2006 film X-Men: The Last Stand, played by Bill Duke. This version is African American and is the head of the Department of Homeland Security and is only referred to as Secretary Trask in the film. He is widely considered a different character from the character that appears in the later films after their release. Trask Industries is alluded in the mid-credits scene of the 2013 film The Wolverine. As Professor X and Magneto warn Wolverine of an upcoming threat to mutant-kind, a television at an airport security checkpoint displays an ad for Trask Industries. 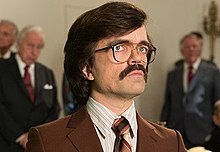 Bolivar Trask appears as the main antagonist in the 2014 film X-Men: Days of Future Past portrayed by Peter Dinklage. In the film, Trask learns of mutants' existence from Charles Xavier's dissertation from Oxford University, provoking him to seek harnessing mutant powers for his weapon-making agendas as well as creating the Sentinel program. He does not seem to have a personal hatred for mutants, and views them as a means to bring about world peace by uniting humanity against a 'common enemy'. This leads some to view him as insane and callous. Mystique discovers Trask conducts inhumane and fatal experiments on mutants, including some of the X-Men and the Brotherhood of Mutants. In the original timeline, Mystique kills Trask in retaliation, resulting in both his martyrdom and a dystopian future where more advanced versions of Sentinels have pushed both mutants and humans to the brink of extinction. The film revolves around the X-Men having the time-displaced Wolverine rally the younger versions of Xavier and Magneto to prevent this future from coming to pass. They are able to spare Trask from his 'original' death, but the ensuing fight as Magneto tries to kill Mystique to ensure that she cannot have another chance to kill Trask later, resulted in Magneto, Mystique and the younger version of Beast being witnessed fighting in public, prompting President Richard Nixon to approve of Trask's Sentinel program. At the subsequent unveiling, Trask is again targeted by Mystique, this time the event attacked by Magneto having laced the prototype Sentinels with metal to turn them against their creators. Mystique stops Magneto's attack and prepares to kill Trask, and stops only when Xavier persuades Mystique to stand down via telepath conversation. By doing this and sparing Trask, history is rewritten: Mystique's stopping Magneto's attack and leaving without causing further harm becomes a convincing demonstration to the world that not all mutants are against humanity, and the U.S. cancels the Sentinel program. At the end of the film, a newspaper article states that Trask was arrested for attempting to sell his Sentinel designs to foreign countries. A mid-credits scene in the Rogue Cut shows Trask incarcerated inside the cell that once held Magneto underneath the Pentagon. The character appeared in the Ultimate Spider-Man video game, voiced by John Billingsley. Bolivar Trask is mentioned in X-Men Legends II: Rise of Apocalypse in stage 4 concerning his Sentinels and how they have been changed to help protect New York from the forces of Apocalypse. The character is briefly mentioned in X-Men: The Official Game as taking over supervision of Multiple Man. He is also mentioned by Beast that he helped William Stryker create the Sentinels and Master Mold with HYDRA's backing. Bolivar Trask appears in the video game adaption of X-Men Origins: Wolverine, voiced by Bumper Robinson. This version is African-American, he is shown researching the mutant gene for Symstemized Cybernetics Lab/SCL (Sebastian Shaw's company) and also helping to build Sentinels. In the game's continuity, worklogs accessed by the player as they search his base reveal that Trask initially did not have anything against mutants and simply took part in the Sentinel project for the scientific value. However, after witnessing a violent incident which involved a mutant test subject, he came to see mutants as a menace, believing that humanity could only be protected if mutants were eliminated, describing them as freaks of nature. He is seen in the future epilogue of the game in which the Sentinels rule the Earth (a la Days of Future Past). Notably in the game, he loses his left hand to Wolverine (similar to the losing of Weapon X's Professor Thorton's right hand) requiring Trask's handprint to get through a door in the facility that he is searching, only to have it replaced with a cybernetic hand in the future. In The Amazing Spider-Man a sign that reads "Trask Industries Sells the Suit" can be seen on the road. Bolivar Trask's hatred of mutants is discussed in the non-fiction book From Krakow to Krypton: Jews and Comic Books. ^ Age of Apocalypse #1. Marvel Comics. ^ Hoare, James (May 14, 2014). "X-Men: Days Of Future Past director Bryan Singer talks X-Men continuity". SciFi Now. ^ Kaplan, Arie (2008). From Krakow to Krypton: Jews and Comic Books. Jewish Publication Society. p. 113. ISBN 978-0-8276-0843-6. This page was last edited on 20 April 2019, at 11:44 (UTC).